When the Warhawks rolled into Lincoln for the Intercollegiate Team Championships practice session on Wednesday afternoon, the team didn't look sharp nor post season ready. And when the tournament got underway Thursday morning, they proved the coaches thoughts correct. However, midway through the 24 game qualifying block, the guys made a flip in their mentality and shot making and decided that they wanted to make a run for the top of the leaderboard. So three consecutive great sets jumped the Warhawks from 15th to 2nd! ​It was then time for the tournament to really begin. The team opened with Arizona State University. ASU showed a lot of heart and fight as they took a pair of games from the Warhawks, but it wasn't enough to keep the Warhawks down. We went on to win that match 4-2. In the second round, the Warhawks faced the most prestigious and respected program in college bowling, Wichita State. The team dug real deep and averaged 237 for 5 games and was able to shock the Shockers and win 4-1 giving them a two round by on Friday morning. ​The win over Wichita State set up a rematch from last years 5th round with last year's runner ups, McKendree University. After some stunning and down right shocking matches in the first two rounds on Friday, the Warhawks came in mentally ready to keep turning heads. Unfortunately, the team couldn't get anything going on the fresh and fell to McKendree 1-4. 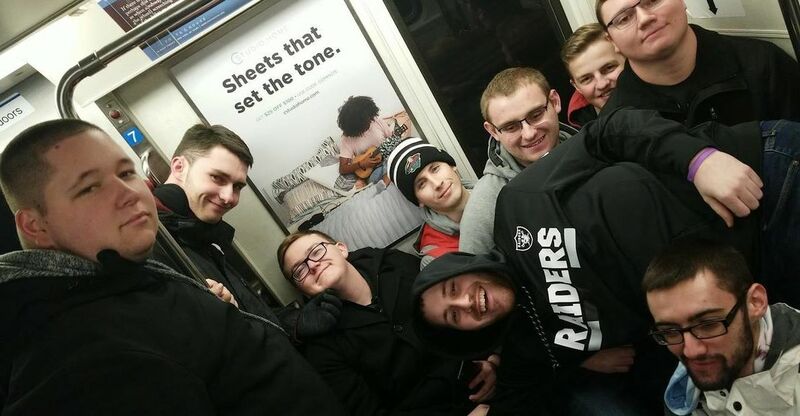 The team then had to immediately jump into a match with William Paterson University, who won the Collegiate Club Championships. While both team made several mistakes throughout the match, the Warhawks were able to win the match 4-1and make their second straight semi-finals appearance. 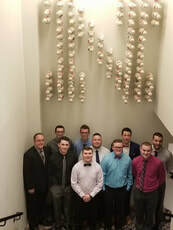 ​In the semi-finals, the team once again faced off with McKendree University for a change to compete for the national championship. While there were several opportunities for the Warhawks to roll the Bearcats 4-0 and force a second match, due to not taking every opportunity we had, we were down 2.5 - 1.5 after 4 games. With the teams backs against the wall, McKendree once again proved to be too much for the Warhawks. 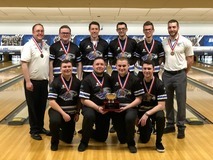 This loss ended the Warhawks' run at the national championship but the team did bring home hardware for the second straight year, finishing in 3rd place! ​After watching McKendree win their second national championship in three years, the All Tournament Team was announced. And for the second straight year we had at least one player named to this prestigious team. Junior Co-Captain Josh Pate was named to the All Tournament Team for the first time in his career! Our Intercollegiate Team Championships started out with success. 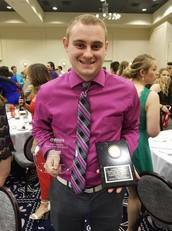 At the Night of Champions Banquet, Junior Co-Captain Josh Pate was honored as both a National Collegiate Bowling Coaches Association (NCBCA) and an International Bowling Media Association (IBMA) Honorable Mention All American! Congratulations, Josh! All it takes is 16 games! For Sectionals, the team was assigned to the Smyrna, TN sectional. This was the absolutely last choice that the team wanted for our sectional assignment. The last time the team didn't qualify for the Intercollegiate Team Championships was in this center back in 2012-13 season. And in fact, the national championships that year were held in Lincoln, NE. The exact same location as this year's national championships. So the team had some history that they wanted to rewrite heading back to Smyrna again! 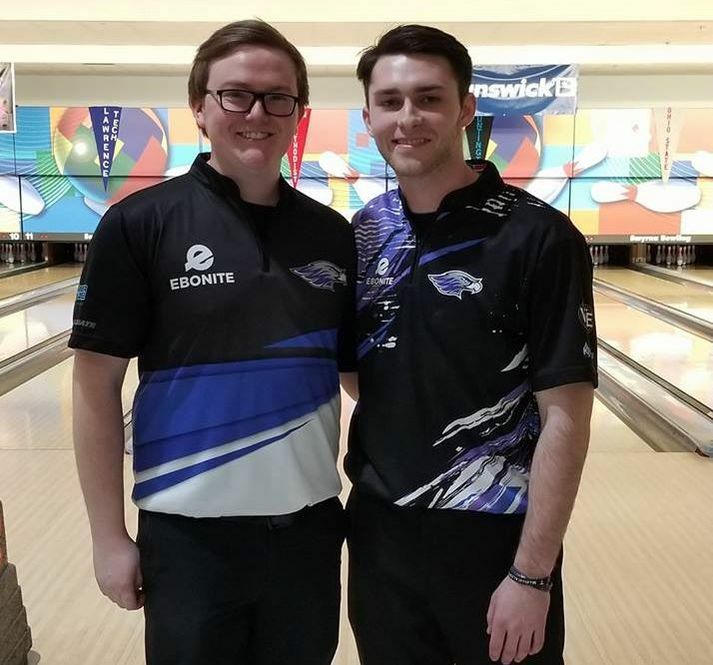 ​The trip started out successfully on the individual level as two Warhawks qualified for the Intercollegiate Singles Championships in Lincoln. Sophomore David Eggert and Senior Chris Wiley finished 2nd and 3rd respectively in a field of nearly 200 players. ​The tournament then shifted focus to the team qualifying process. Saturday morning was extremely rough but there was a slight glimmer of hope on Saturday afternoon. The Warhawks shot a couple of big sets to put them in the top 4 for just a brief moment. But the rest of the afternoon wasn't as successful as the Warhawks found themselves in 7th place after the first day and only 116 pins out of 4th place. ​The team had a great team meeting on Saturday night and a new game plan was created. The guys walked in with a positive attitude and outlook that the day would be different. Well, it was. Unfortunately the morning block was a "bad" different. The team found themselves still in 7th place, but now they were 283 pins out of advancing to the national championships. Most teams would have folded and thrown in the towel at this point. However, the coaching staff truly believed in the team and had the guys have a meeting amongst themselves during the lunch break and figure out a game plan to come back in and fight for the opportunity to make our fifth consecutive national championship. ​Well that is exactly what happened. These guys put four huge sets together this afternoon. Our four sets were 858 (204, 173, 225, 256), 837 (194, 227, 197, 219), 864 (224, 203, 223, 214) and 822 (220, 224, 191, 187). They dug deep, made big plays, filled frames, trusted their coaches and never doubted for one second that we wouldn't be in Lincoln (or Omaha according to Schneider) next month! And not only did we run the up the leader board to claim our spot in the top 4, we finished 3rd! ​The heart, fight and tenacity of these guys proved why we are the 2nd ranked team in the nation. We may not be the second best technically sound team in the nation, but we live the definition of what it means to be a TEAM! There isn't another program that matches what we have in the team category and that is why we knew we would punch our ticket to Lincoln! The Warhawks finished their regular season on a high note by finishing 2nd at the 78 varsity team Hoosier Classic! For the second year in a row, the team found early success in the ttournament. However, it was with two very different scores. In 2016, the team sat in 2nd place after the first day at +132,and only five teams were plus. This year, the team lead after day one at +507, with 19 teams going plus the first day. However, Sunday was a different pattern and the team didn't match up as well. 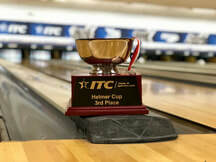 But they did bowl well enough to finish 2nd behind Wichita State University. ​The team then moved on into the bracket. In the opening round they took on William Penn University. This team, while ranked just outside the top 16, is not a team to be overlooked. Whitewater came out strong winning the first game, in a best of three match. However, William Penn caught a few breaks and made some better shots down the stretch and went on to take the final two games from us. And for the second year in a row, the team that knocked us out in the first round, went on to win the bracket championship for the Hoosier Classic. ​Based on our finish at the Hoosier Classic, the team finished the 2017-18 regular season ranked 2nd in the nation. 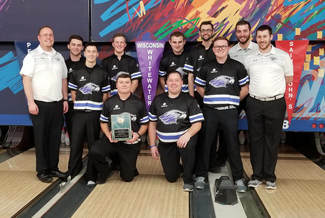 This is the highest ranking for the program in the 30+ year history of UW-Whitewater bowling. The team also earned the most points in Tier 1 competition and they had ZERO players finish in the top 20 individually for the first time in six years! Now, on to post season! 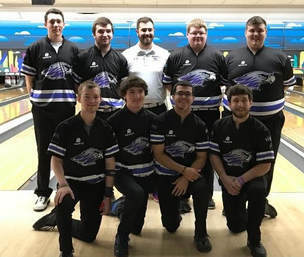 One week after getting the spring semester in action, the Warhawks traveled to Wausau, WI for the third installment of the Great Lakes Bowling Conference. All three teams were in action. ​After a slow start, the varsity team hit the accelerator and sailed past UW Madison (after being down 140 pins the first two games) to claim a first day lead by 222 pins. 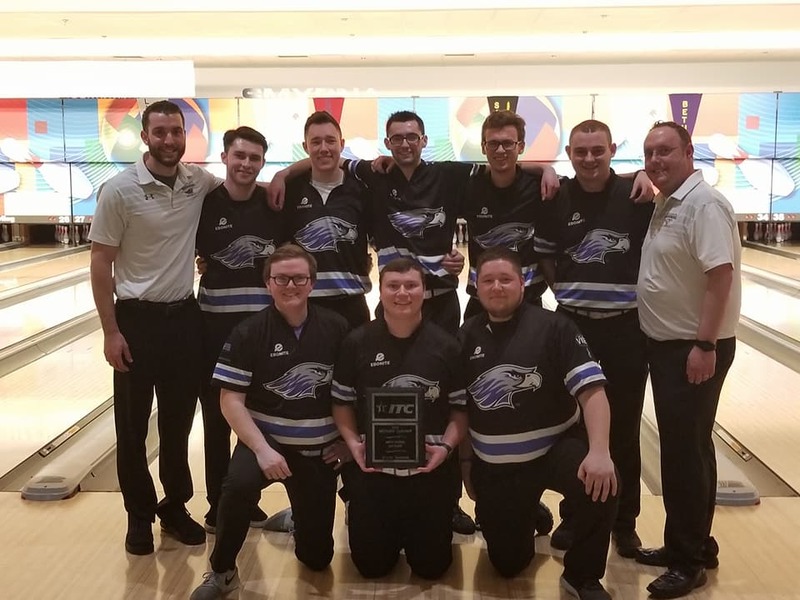 Bakers were up and down throughout the day and after a dismal final set, the team claimed a 271 pin victory over UW Madison and 434 pins over Highland Community College (coached by former Warhawk Assistant Coach Kris Beach). Our JV teams swept the top two spots in their division and would have finished 4th and 6th overall. ​On the individual level, three Warhawks turned in top 5 finishes. And this All Tournament was lead by a pair of freshmen from the Rockford, IL area! Hunter Loveridge, a two hander, went +108 for six games (218 average) while Brandon Mooney, a lefty, went +100 for his six games (216.67). Junior Co-Captain Josh Pate finished 3rd overall at +82 (213.67). Just missing another All Tournament Team finish was sophomore David Eggert who went +43 (207.17). The Warhawks will now enjoy a weekend off before coming back for a pair of tournaments to complete their regular season. February 10th and 11th the team will travel to Freeport, IL for the GLBC #4 and Conference Championships. Then on February 17th and 18th the team will travel to Indianapolis, IN for the final Tier 1 of the season, the Hoosier Classic. Good luck to the team as they finish their regular season! With the start of 2018, the Warhawks returned to action. 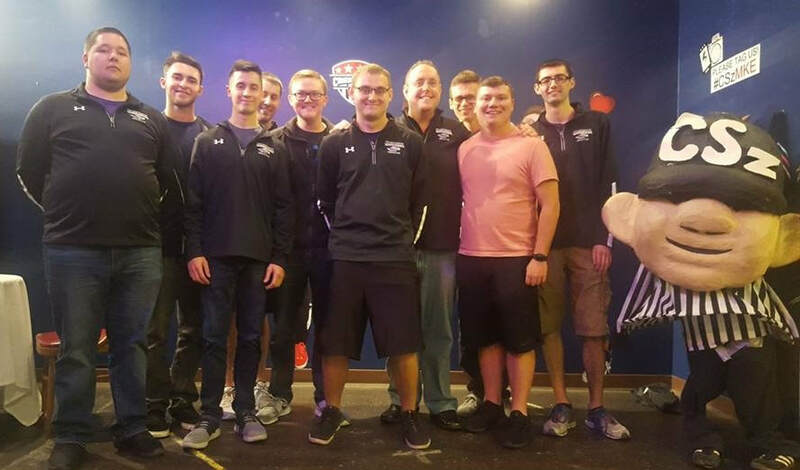 The Varsity and JV 1 teams were back in action at the Tier 1 ISBPA/Kegel Midwest Collegiate Classic at Stardust Bowl in Addison, IL. ​The Varsity team struggled on Saturday despite two practice sessions on campus prior to leaving. After the first five games, the team sat in 12th place at -61. However, after a couple of really good team meetings, the guys rallied back on Sunday and went +86 in baker to end the weekend at +25 and an 8th place over all finish. ​The JV team, which was lead by Varsity Assistant Coach Nick Kruml, struggled both days but turned in a stellar 2nd place finish. The Warhawks enjoyed another successful trip out east! 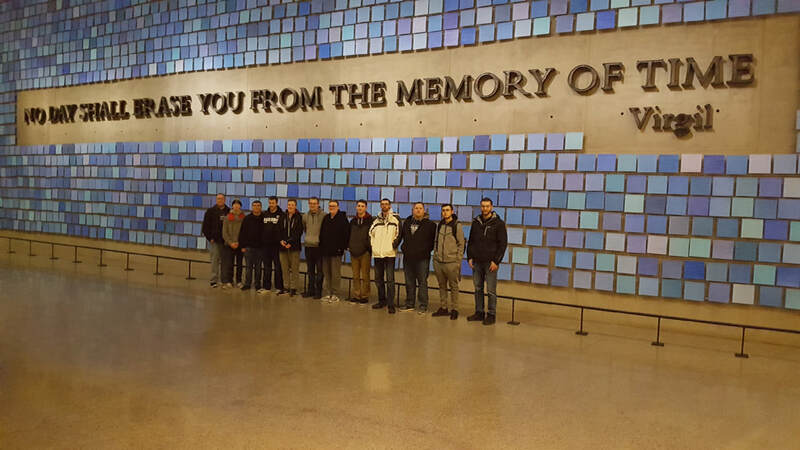 The week started with a trip to the 9/11 Museum and Memorial! No matter how many times I visit this place, the awe and memories never change! While it was a bit cold, we thoroughly enjoyed the time in New York City! ​It was then time to begin bowling. The team started the Keystone Quaker Classic on December 27th. The team had a successful day 1 to be in second place. Both Josh Pate and Chris Wiley earned All Tournament Team honors for finishing 4th and 5th respectively at this event. Day two, despite the pattern playing completely different, the team was able to knock down enough pins in baker to sail to a 181 pin victory over St. John's University and Robert Morris University - IL and defend their first tier 1 win from last season! ​Then the Lehigh Valley Classic began. This was a different story. The scoring pace was much higher at this event. The team was steady the first four games but really struggled to put anything together the final game of the day and ended day one in 5th place. However, after a great team meeting on Friday night, the team really banded together and bowled the best baker block that they ever have. The team averaged 223 over 20 baker games, which was the highest baker total of the day. This allowed the team to jump up to 3rd place over all. ​Now our fall semester has ended and the Warhawks will find themselves ranked 2nd in the nation! 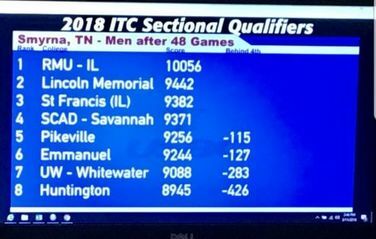 While this is very exciting, there is still a lot of work to do in order to maintain that top 5 ranking and make another trip to the Intercollegiate Team Championships come April! It was quite the historic weekend for the Warhawks! 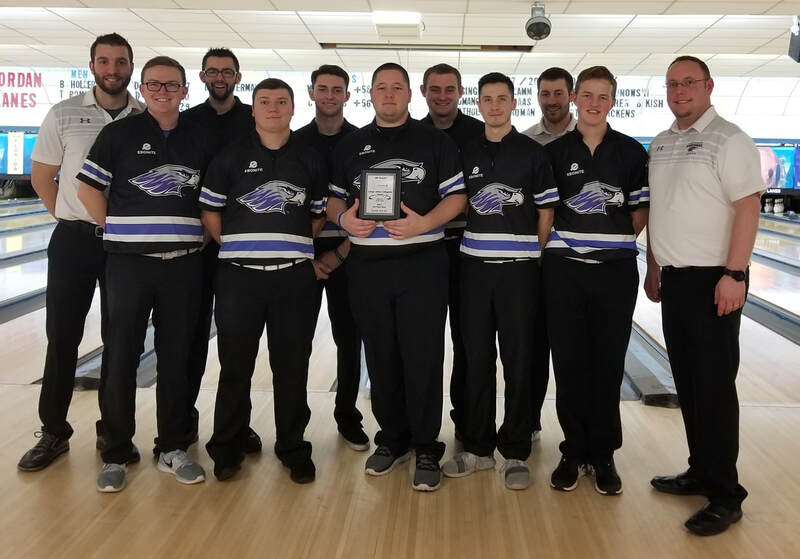 The varsity team earned their third tournament win of this 2017-18 season by leading the qualifying portion of the Warhawk Open by 252 pins over Davenport University! Our JV2 team finished 2nd among JV teams while the JV 1 team was 5th out of 11 JV teams! And again, congratulations to David Eggert and Aaron Turner for both making the All Tournament Team! Also with both David and Aaron making the All Tournament Team, they represented the 99th and 100th players to be named to a regular season All Tournament Team! Congratulations on an amazing weekend Warhawks! Now we take some much needed time off to prepare for the end of our academic semester as well as prepare the varsity team for their trip out east between Christmas and New Years for a pair of Tier 1 tournaments. As I tell every recruit and player, there is a learning lesson in every tournament regardless if you bowl well or not. This statement couldn't have been more true as it was this past weekend. The Leatherneck Classic is a 46 varsity team Tier 2 tournament (3rd largest varsity tournament in the country). And after a successful start to the fall semester, the team was hoping to continue the momentum rolling into this tournament. Unfortunately, it was another learning lesson for the teams. ​For the first time in several years, the Warhawks missed the bracket at this tournament. While they didn't bowl completely terrible on Saturday (only minus 58 on the day), the team found themselves 565 pins back from the leader and over 300 pins away from making the bracket. So the team regrouped mentally and created a new game plan for bakers on Sunday. The team started hot out of the gates firing sets of 906, 906 and 859. Then a 20 minute breakdown proved to be too much for the team and halted their run both physically and mentally. A poor performance the last set left the team with an 11th place finish. ​On the brighter side, the JV team finished 2nd in the 20 team JV portion of the tournament (largest JV field in college bowling). They went into the bracket and lost in the first round 1-2 against St. Ambrose University JV1, who went on to win the tournament. 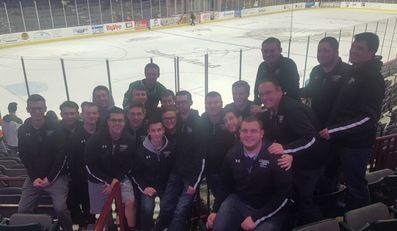 ​Despite the bowling, the teams had a great time on Saturday night as they attended a Quad City Mallards minor league hockey game. The team will now prepare for our home tournament the first weekend of December in Addison, IL. Hopefully we will have a good showing there to build the teams confidence prior to heading out east between Christmas and New Years! It was certainly a tale of two very different days! The varsity team struggled to make quality shots and to fill frames yesterday. After a good team meeting last night and a new game plan for today, the team bowled much better and was able to jump from 5th to 3rd. While not the end result we were hoping for, we were able finish qualifying knowing we were back to our normal selves. JV 2 finished 2nd in their division while JV 1 was 3rd. Then in bracket play, the opening round of the JV bracket saw our two JV teams duke it out. JV 2 ended up winning 2-1. JV 2 then faced high qualifier Robert Morris. This was a back and forth match which ended in a 2.5-2.5 tie. And based on tournament rules, total pinfall was the deciding factor, which allowed our JV 2 team to earn the win 971-901. Congratulations JV 2! In the Varsity bracket, we faced #6 seed Rock Valley in the opening round. We were able to win 2-1. We then went on to face #2 seed, UW Madison. Once we were able to sort out the practice debate, we were able to sail to a 2-0 victory. It was then on to the finals against Robert Morris (#1 seed). We agreed to go to a fresh pair for the finals and the first four games were all won on the left lane. So in game 5, we were able to take advantage of a couple breaks and went on to win the 2017 Titan Invite 3-2! This bracket win (and better all around day today) will give the team some confidence heading into the Leatherneck Classic next weekend in the Quad Cities! Looking forward to seeing how next weekend goes as this will feature a Tier 1 quality field. On the teams first off week since the competitive season started, collegiate and PBA champion Josh Blanchard came to campus to work with the team. Josh is a three time NCBCA First Team All American, a Two Time collegiate ITC Champion, a PBA Rookie of the Year and a three time PBA champion! Josh also just published his first book, Bowling: Energy in Motion with a golf sports psychologist. ​Josh came to campus and talked about his book and conducted brain maps on each of the guys. The brain maps showed whether the players were left or right brained and then either front or back brained dominant. This knowledge will help both the players and the coaches know how to improve their mental process while in competition. ​Then on Sunday, Josh lead the team in three team building activities. These activities got the team working together, learning to trust and communicate with each other and just have a good time. Josh was able to relate the activities to college bowling and it hit home with the guys. Hopefully they will be able to take this experience and continue to improve their performance the remainder of the season. ​There were also some great individual games bowled on Saturday. ​It was an all around good weekend for the team. The team is poised heading into a two week break before we get back to action in November at the Titan Invite! The varsity team competed in our first Tier 1 of the season. On Saturday, the team got out to a very rough start by shooting 904 (in a five player team game). The team then rallied back to finish the day +332 on the day to finish 6th place. Senior Co-Captain Aaron Turner lead the Warhawks and finished 3rd individually for his first Tier 1 All Tournament Team! Also performing well for the Warhawks was Junior Josh Pate who shot 1286 to finish 35th and Sophomore Ryan Winters shot 1276 to finish 38th. Corben Sadowski shot 1020 for five games while Chris Wiley shot 627 for three games. Then today, the guys bowled extremely well in bakers and shot four game sets of 840, 962, 850 and 825 to finish the tournament +609 and 4th place overall. This finish is the best in program history at the Midwest Collegiate Classic! This has been a great start to our season. Now to keep it rolling! 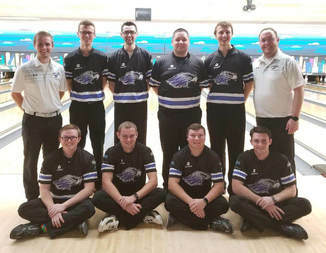 ​Next up for the Warhawks will be the second Great Lakes Bowling Conference Tournament next weekend at AMF West in Milwaukee, WI! Hope to see a ton of family, friends, alumni and recruits in attendance! 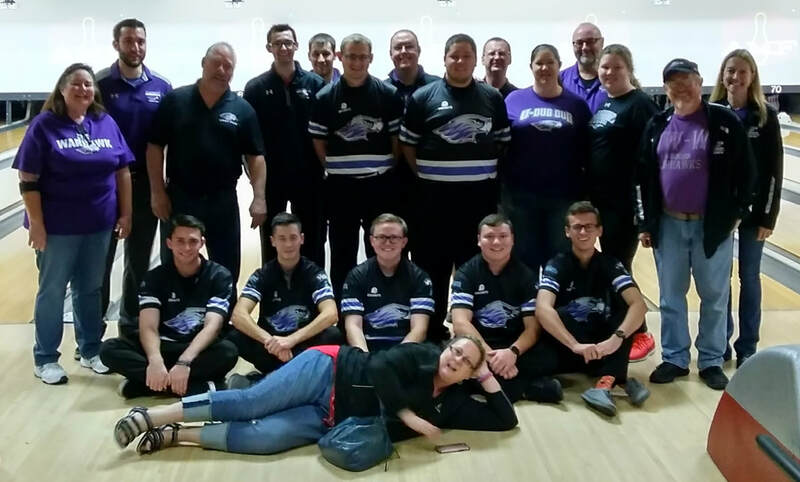 The Warhawks kicked off the 2017-18 season by sweeping the Great Lakes Bowling Conference I tournament in Bloomington, MN! The Varsity team bested every team in the field while our two JV teams beat every other varsity team in the field. This is the third consecutive time this has happened for the Warhawks in conference play. ​Leading the way for the Warhawks was Sophomore Ryan Winters. Ryan shot 1308 for 6 games to claim his first individual title and second over all All Tournament Team finish. Senior Chris Wiley shot 1272 for a 2nd place finish while Junior Co-Captain Josh Pate shot 1260 to finish 4th. 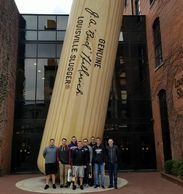 Several JV players averaged over 200 in the first tournament of the season including: Corben Sadowski (214 for 5 games), Austin Kappel (210 for 4 games), Hunter Loveridge (204 for 3 games), and Chris Carroll (200 for 3 games). ​Next up for the Warhawks will be the Midwest Collegiate Classic in Wauwatosa, WI. This is the first Tier 1 (major) of the season. Looking forward to see how the team stacks up against some of the top teams in the nation! 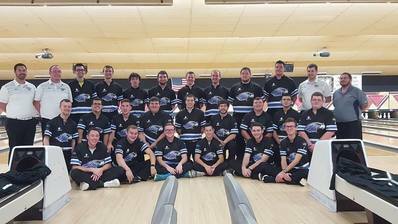 The 2017-18 UW-W Warhawk Men's Bowling Team has been set! This year's program will not only turn to returning players to step up and make a greater impact, but they will also look to now players to the program to earn a spot on the Varsity roster come the spring semester. ​Due to space and time limitations, our tryout process took a little different look this season. We still had each of the 34 players trying out complete a pre-tryout interview, but then we exempted four players from having to try out. The remaining 30 players bowled 8 games where they were evaluated in the following statistical categories: single pin spare percentage, multi pin spare percentage, strike percentage, fill percentage, average and pocket percentage. After Monday, another 7 players were exempt from the remainder of tryouts. The remaining players bowled three games on Tuesday and three additional games on Wednesday. After Wednesday, the remaining 13 spots were awarded. ​Looking forward to see what this group of players will be able to accomplish. Check back frequently throughout the season to catch recaps of all the action!